If there were founding fathers of the craft beer movement, California would definitely be one of them. With 700 breweries all over the Golden State, California has become a beer mecca for beer lovers, connoisseurs, and simply those in search of the perfect small batch brew. The craft beer movement began in San Francisco in the mid-1960s and today is responsible for a whopping $7.288 billion of the state’s economy. This monumental industry began in small batch breweries often searching to find the perfect mix of craftsmanship and science. Their experimentation has elevated the palates of modern day beer drinkers to appreciate what people are making at smaller scales in a big way. While many have driven a along the California coastline for the panoramic views and scenic vistas, the next time around travel from the self-proclaimed birthplace of craft beer in San Francisco to Santa Rosa to learn what makes the Nor Cal beer culture truly unique. Anchor Brewing Company can be traced back to the California Gold Rush in 1849. They have maintained a high-level of craftsmanship for over 100 years with a year-round rotation of several seasonal and popular beers. Anchor Brewing Company is most known for their unique steam beer brewing techniques. Made from brewing larger yeasts at warmer fermentation temptations, the Anchor Steam was first brewed in 1896 and is still beloved today. ThirstyBear Brewing Company is the first, and only, San Francisco brewery to to brew certified organic beer and become a certified Green Business. Celebrating 20 years in August, ThirstyBear is best known for their flagship brews, cask conditioned ales and barrel-aged releases taking a German influence on west coast brewing. Their brewpub serves up an array of Spanish tapas dishes and uniquely has launched a charcuterie and beer-pairing menu. Cellarmaker has been making waves in the craft brewing industry for their small batches of experimental beers. Their rotating tap aims to include the perfect mixture of budding brews to provide a variety in their tasting room that compliments their different styles of brewing. This ever changing and evolving list of beers allows Cellarmaker to experiment with different hops, grains, barrels and yeasts. There is never a dull moment in their bustling taproom on Howard Street serving one-third of their beer on-site and the rest distributed to local bars and restaurants in the Bay Area. 21st Amendment Brewery is aptly named after the constitution that ended prohibition. With a restaurant location a few blocks away from AT&T Park and a larger factory, tour and event space in San Leandro, the 21st Amendment Brewery has found a way to brew award-winning handcrafted house beers in an inviting gathering space. They are best known for their El Sully, a Mexican-style lager, but be sure to give the India-style Red Ale Toaster Pastry, the black IPA Back in Black or one of their seasonal beers a try. Linden Street Brewery is dedicated to creating handcrafted beers made by head brewer Shane Aldrich with only the finest ingredients sourced locally whenever possible. While their rustic brewery exuded the industrial vibe of Oakland, they will soon be opening their new home in the city with a bigger indoor space to hold tasting tours and other on-site events. Expand your palate by giving the Thai Gose and rich Barrel Aged Imperial Porter a taste. Drake’s Brewing Co. (pictured at top) has had a longstanding love affair with the Bay Area. Over the years, their beers have adapted to the changing brewing styles and flavors of the West Coast to become one of the most sought after beers in California. 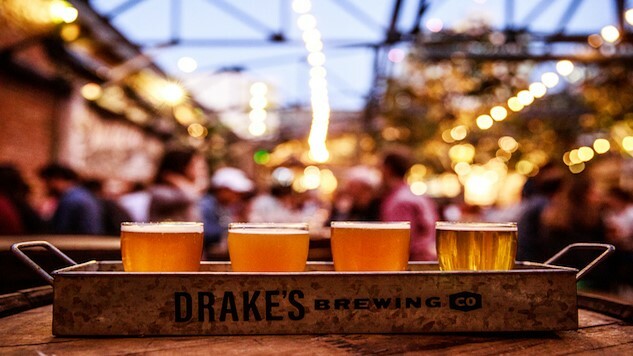 Whether you are touring their brewery and barrelhouse in San Leandro, or swinging by Drake’s Dealership restaurant for a flight and bite to eat in Oakland, their industrial vibe has struck a cord with locals as Drake’s continues to expand.